If you have oily or acne-prone skin, these wonderful double ACNE TREATMENT N1 are must have! You save $2 buying charcoal/bentonite soap and facial mask together. 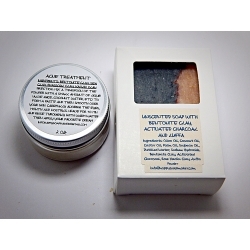 You will get 2oz of Acne Treatment facial dry mask and one 4.1-4.4 oz of Activated Charcoal/Bentonite clay soap. Using this charcoal/bentonite clay bar twice every day (on morning and on evening) and facial organic clay mask one/two times a week on your face can reduce or eliminate acne, bumps and blackheads! 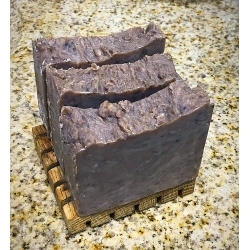 This charcoal/bentonite clay soap is also a great body bar for an all over skin detox. Bentonite clay and Activated Charcoal work together to draw out toxins and dirt from your pores like a magnet to leave your skin fresh and clean. You will feel a difference the first time you use it. 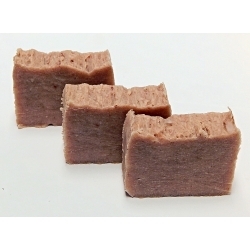 The top layer of soap contains Rose Kaolin clay and Luffa powder which provides mild exfoliation properties. There is large amount of Olive Oil in my soaps which is extremely mild and moisturizing while still being very cleansing. There are combination of great clays in my organic facial mask which makes a miracle treatment for your skin! You will get a full 2 oz jar of mask. For one procedure you will need to use 1 teaspoon of mask, add a little bit water (aloe juice, coconut milk, tea etc), apply to clean skin and after 10 min wash with a warm water. You will feel how your skin is clean and fresh. Now is the time to get your next treatment (your favourite tonic and cream or lotion). I recommend to add few drops of lemon juice and tea trea oil. Your skin will be lighter and fresher. Bentonite Clay and Sea Clay are great for oily skin. Excellent absorbing properties, help to remove acne causing toxins from the skin and revitalize tired skin. Rhassoul Clay is useful on oily, tired and sensitive skin. Contains higher levels of magnesium, potassium and calcium. It helps to detoxifying skin due to the naturally high levels of minerals found in the clay. This Birch Tar handmade all natural organic soap with Rhassoul clay is MUST HAVE for those who have a problem skin. It helps to get rid of blackheads, heal or prevents acne and clogging of the pores. Birch Tar is a natural antiseptic; In addition, it increases blood flow to the skin, dry wounds, accelerating the processes of regeneration and removing pain. Acne, eczema, seborrhea, psoriasis and itchy skin have all been successfully treated with birch tar, and because of the naturally occurring salicylic acid and methyl salicylate (an organic ester) in birch tar, it acts as a natural exfoliator that sloughs off dead skin and tones new skin. Rhassoul clay helps to reduce dryness and flakiness, helps to improve skin clarity and elasticity. It is rich in magnesium, Silica, potassium and calcium. It is used in rejuvenation, detoxification and toning of the skin for those with normal or oily skin. If you have oily or acne-prone skin, this clay mask is a must-have! This combination of great clays will make a miracle treatment for your skin! Tea Tree Neem Oil soap has incredible properties for our skin! It is an antibacterial and antifungal, soothing and moisturizing, can clear up acne, helping to create naturally glowing smooth skin. Neem Oil is ideal for acne-prone skin because it can help to soothe irritation and inflammation, clear up pimples and remove bacteria from the surface of the skin that can cause more break-outs. Neem oil contains an aspirin-like compound that helps with acne conditions by ridding the skin of acne-causing bacteria. It also helps reduce redness and inflammation. 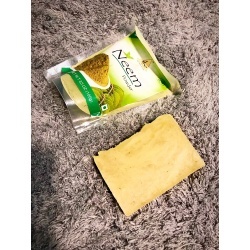 This soap is made with cold pressed Neem Oil. I add Rose Kaolin clay for extra cleansing properties and Tea Tree Essential Oil which helps control blemishes without being overly drying for the skin. - Shea Oil moisturizes well without clogging pores, contains vitamins such as vitamin A and vitamin E. It provides the extra vitamins, nutrients and protection your skin needs during the cold season and summer time. 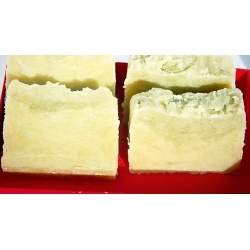 - Canola Oil contributes protein and moisturizing qualities in soap. - Apricot Kernel Oil which is rich in Vitamin A, Oleic Acid and Linoleic Acid and exhibits skin softening, moisturizing properties and is therefore recommended for dry skin, irritated or has prematurely aged. Those who have never used Neem Oil Soap before should be aware that it has a Garlicky odor. Even with Tea Tree essential Oil you can sense this odor. Luckily the smell does not linger after rinsing the Neem oil soap off and drying yourself. But benefits for the skin are worth! This ACNE TREATMENT N2 is a little bit different from ACNE TREATMENT N1 and works great to remove blackheads and other inflammations. You save $2 buying Tea Tree Bentonite soap and facial mask together. 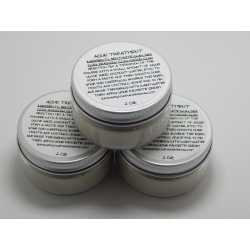 You will get 2oz of Acne Treatment facial dry mask and one 4.1-4.4 oz of Tea Tree Bentonite clay soap. 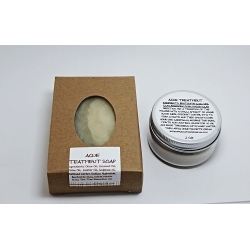 ACNE TREATMENT Soap with Tea Tree oil, mineral rich detoxifying soap bar with Bentonite and White Kaolin clays will absorb excess oil of the skin without drying, cleans and tones all skin types. Bentonite clay is a wonderful antioxidant which aids in ridding your skin of harmful toxins and impurities. White Kaolin Clay is the most gentle and fine clay and works as a cleaning agent that effectively cleanses and invigorates the skin. Tea Tree Oil soap has incredible properties for our skin! It is an antibacterial and antifungal, soothing and moisturizing, can clear up acne, helping to create naturally glowing smooth skin. Using ACNE TREATMENT soap twice every day (morning and evening) and facial ACNE TREATMENT FACIAL MASK two times a week on your face can reduce or eliminate acne, bumps and blackheads! ACNE TREATMENT FACIAL MASK contains a combination of great clays which makes a miracle treatment for your skin! Pamper your face with this detoxifying clay soap. Also this is a good spa treatment for your body. A mineral rich detoxifying soap bar with Bentonite and White Kaolin clays will absorb excess oil of the skin without drying, cleans and tones all skin types. Bentonite clay is a wonderful antioxidant which aids in ridding your skin of harmful toxins, blackheads and impurities. This all natural detoxifying Clay Soap is suitable for all skin types, but especially beneficial for those with oily skin. Also it is great to use this soap as a shaving bar. Tea Tree Oil soap has incredible properties for our skin! It is an antibacterial and antifungal, soothing and moisturizing, can clear up acne, helping to create naturally glowing smooth skin. Free from parabens, synthetic fragrances, sulfates, formaldehydes, nanoparticles, and artificial colors.